All items offered in various quantities daily, just call for availability! White plastic folding chairs. Comes standard with our package deals. They are $1 each per day. Black plastic folding chairs. Perfect for all events. They are $1 each per day. White padded folding resin chairs. Great for weddings and high end events. Priced at $3 each per day. 8ft tables allow seating for up to 10 people. They are $7 each per day. 60in round tables allow seating for 8 people. They are $8 each per day. 10x10 tent is our smallest available and can be used for anything you want. They are $30 each per day. 10x20 tent can be used for anything you want. They are $125 each per day. 20x20 pole tent can be used for anything you want. Grass set up only. They are $150 each per day. 20x20 frame tents have no stakes for anchoring. Ideally they are made for driveways and/or concrete set ups. They are $225 each per day. 20x30 tent can be used for anything you want. Grass set up only. They are $175 each per day. 20x30 frame tents have no stakes for anchoring. Ideally they are made for driveways and/or concrete set ups.﻿ They are $300 each per day. 20x40 pole tent is our largest available and can be used for anything you want. Grass set up only. They are $200 each per day. 20x40 frame tents have no stakes for anchoring. Ideally they are made for driveways and/or concrete set ups.﻿ They are $400 each per day. These generators can be used for anything. 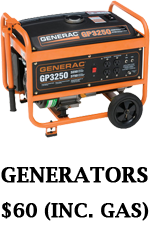 Whether if your power went out and you need a source to run the necessities, or if you need help powering outdoor equipment, these generators will also power any of our inflatables where a power outlet isn't available. Plus many other uses. Includes a full tank of gas.